The DC Chamber of Commerce is pleased to announce the honorees of this year’s Chamber’s Choice Awards, spotlighting the best and brightest of the city’s business community. These six awardees – Comcast, Joe Rigby (Pepco), Washington Nationals Dream Foundation, the George Washington University, the Washington Area Community Investment Fund and Marcella A. Jones – were chosen for exceptional leadership, extraordinary standards of professional excellence, and commitment to the community. Below are the categories that make up the Chamber’s Choice Awards and short profiles of each honoree. Comcast is one of the nation’s largest video, high-speed Internet and phone providers to residential customers under the XFINITY brand and also provides these services to businesses. Comcast empowers the communities it serves by investing in local organizations, developing programs and partnerships, and mobilizing resources to connect people and inspire positive and substantive change. Together with local and national nonprofit partners, Comcast focuses on improving lives and communities, and creating opportunities in three core areas: Digital Literacy, Community Service and Youth Leadership. Since 2001, Comcast has made more than $344 million in cash and in-kind community investments to support local partners that include the Boys & Girls Clubs of Greater Washington, City Year Washington DC, DC Public Education Fund, Byte Back, Greater Washington Urban League, Latin American Youth Center, the United Way of the National Capital Area and numerous other deserving organizations serving the needs of Washington residents. Chairman of the Board, President & CEO, Pepco Holdings, Inc.
Joe Rigby is chairman, president and CEO of Pepco Holdings, Inc. (PHI), a regional energy holding company that provides utility service to about 2 million customers. Rigby joined Atlantic City Electric in 1979 and advanced through a number of management positions. In March 2008, Rigby was elected president and chief operating officer, adding responsibility for the competitive energy businesses (Conectiv Energy and Pepco Energy Services). Rigby was elected president and chief executive officer effective March 1, 2009. He was elected Chairman of the Board on May 15, 2009. He has announced his retirement as a Pepco Holdings officer effective with the completion of a pending merger with Exelon Corporation. The Washington Nationals Dream Foundation is the charitable arm of the Washington Nationals Baseball Club and is committed to improving the lives of children and teens in the Washington, D.C. region by supporting initiatives focused on academics, the arts, nutrition and sports. In the last two years, construction was completed on two of the Dream Foundation’s cornerstone projects: the Washington Nationals Diabetes Care Complex at Children’s National Medical Center, a state-of-the-art facility unveiled in 2013 offering comprehensive care for children with diabetes; and the Nationals Youth Baseball Academy which opened last year and provides year round academic, athletic and nutritional programming for children in Wards 7 and 8. The Dream Foundation continues to support these initiatives, in addition to providing grants to more than 70 local nonprofits that serve children and families. The Dream Foundation’s newest initiative will help expand access to the benefits of youth baseball by restoring one local youth baseball field every year, beginning with a field in Southwest D.C. slated to open in November, 2015. The George Washington University was created in 1821 through an Act of Congress, fulfilling George Washington’s vision of an institution in the nation’s capital dedicated to educating and preparing future leaders. Today, GW is the largest institution of higher education in the District of Columbia with more than 20,000 students—from all 50 states, the District and more than 130 countries—studying a rich range of disciplines: from forensic science and creative writing to international affairs and computer engineering, as well as medicine, public health, the law and public policy. The Washington Area Community Investment Fund, Inc. (WACIF) is a nonprofit community development loan fund whose mission is to empower underserved communities and individuals in the Washington, DC metropolitan area by providing access to capital and technical assistance to small businesses, childcare centers, affordable housing developers, and community organizations. For over 25 years, WACIF has closed over 315 loans totaling $24.6 million, helping leverage over $150 million in financing for local low- and moderate-income entrepreneurs and nonprofit organizations. WACIF has assisted over 1,750 small business through one-on-one assistance, provided $55 million in access to capital in lending and created more than 1,400 full-and part-time jobs. With over 30 years of experience in fund development, philanthropy, education and leadership training, Marcella Jones is an active member of the Washington, DC and global communities. Marcella worked with the Institute of Cultural Affairs (ICA), a nonprofit world-wide organization concerned with the economic, political and cultural growth and development of cities and communities, for eleven years. She has held key executive level positions in fund development with several organizations in the U.S. and maintains a personal presence in the global business community. Her Excellency Ellen Johnson Sirleaf, President of the Republic of Liberia, recently named the Todee School in Liberia in Macella’s honor. She works closely with the philanthropy, business and media world to promote corporate and individual giving and volunteerism. Marcella has lived and worked in the wonderful City of Washington, DC since 1978. The Chamber’s Choice honorees will be recognized at the annual DC Chamber of Commerce Awards and Gala on October 30, 2015. Each year, the Chamber’s Choice Awards and Gala draws more than 1,000 of the region’s most prominent leaders and decision-makers to one place for an evening of honoring, recognition and entertainment. This year’s Gala will be held at the Marriott Marquis in Downtown Washington, DC. The Chamber’s Choice Awards and Gala is being designed, produced and managed by the Hutchinson Design Group. 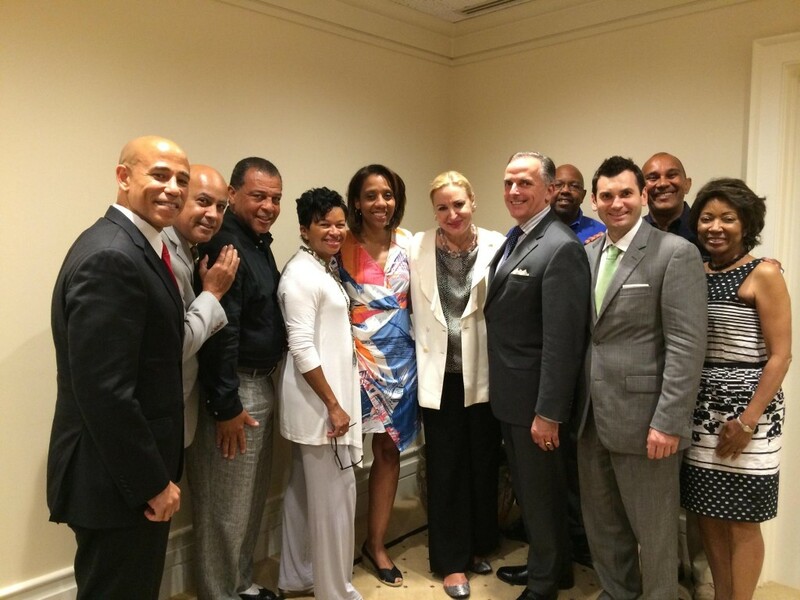 The DC Chamber would like to give a special thanks for Sequoia Restaurant for hosting the Awardee Luncheon. For detailed profiles and photos of last year’s event, please contact Krystal Brumfield, Vice President and Chief Operating Officer, at [email protected]. For more information on the Gala, please visit www.dcchamber.org. The DC Chamber is the largest and #1 rated Chamber in the Washington region. For over 70 years, we have been the champion of local business-large and small-providing passionate advocacy, valuable networking opportunities, and enlightening educational programs.